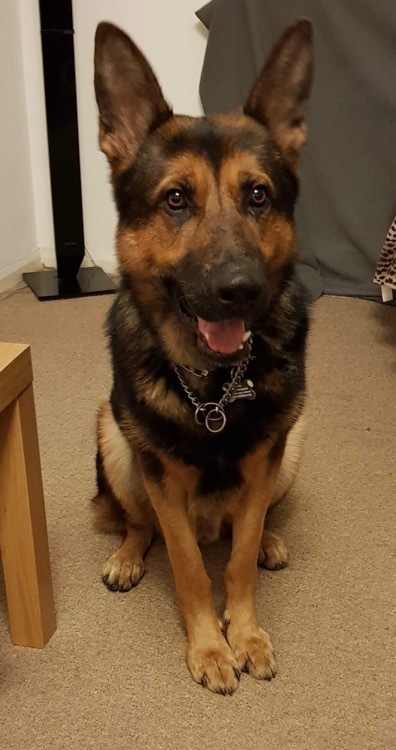 Meet dashing Duke, a 3 year old, neutered male, German shepherd looking for an experienced home. Poor Duke hasn’t had a very good start in life. He was initially bought from a puppy farm by owners who decided they hadn’t bonded with him so they gave him to a friend. He was happy with his new owner but sadly she lost her home and could no longer keep him. He then ended up in the hands of a shop owner who used him as a guard dog and treated him badly. When his current owner first met him he was a very shut down boy, nervous of human contact and in need of a lot of care. His owner has worked wonders with him but sadly as his confidence has grown he has started to feel the need to protect the them. Who can blame him now he finally has a good home? Sadly his family don’t feel able to manage this though and have turned to us for help. Duke needs an adult only, pet free home with someone who can start to teach him better ways to manage his instincts and show him that he can trust other animals near his treasured human. If introduced properly to people he is ok and did settle with our volunteer however he has shown wariness in the past. If you think you can offer Duke the stability and home he deserves please get in contact.